The Texas Revolution and the formation of the Texas Rangers may be a period of American history that the average Brit isn’t overly familiar with, but BLAZE’s new series Texas Rising aims to change that. It does so by tapping into a wealth of historical detail, accompanied by a star-studded cast. Airing Sundays on BLAZE, Texas Rising immediately thrusts audiences into the midst of the action. It picks up in 1836 Texas, a dangerous battlefield where multiple groups of people fought for power. Nobody was safe. The real shining light of Texas Rising is the phenomenal casting. Bill Paxton is excellent in his turn as Sam Houston, Tennessee governor turned victorious Texas leader. The Walking Dead‘s Jeffrey Dean Morgan is a formidable captain. Cynthia Addai-Robinson is also an early highlight, tormented by survivor’s guilt. Other big names, including Thomas Jane, Jeremy Davies, Brendan Fraser, Ray Liotta and Kris Kristofferson, also make this a particularly well-acted series. Texas Rising doesn’t shy away from depicting the brutality and gore of the era and setting (those with fragile stomachs be warned), but unlike other shows, it never feels gratuitous. Instead, it pushes home the point: this Texas is a terrifying place to be alive. Paying careful attention to the era is something Texas Rising excels in, with realistic depictions of action sequences rather than sensationalism. The series adequately captures the fear, wild and uncontrolled nature of the landscape and period through their use of characters, action and stylistic choices. It succeeds in using a Western setting without falling prey to a lot of Western conventions, helped by its historical grounding. 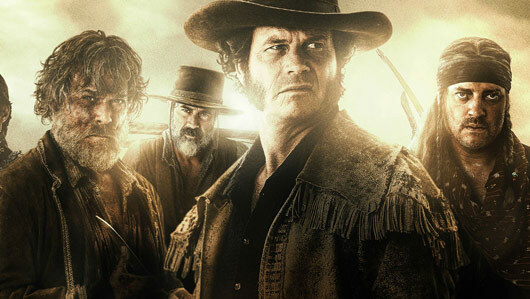 Texas Rising airs Sundays at 10pm on BLAZE (Freeview 63). « When will The Walking Dead return in the UK?